Warren Burt (born 1949) is a composer, performer, video artist, sound poet, writer, and instrument maker (hardware and software, electronic and acoustic). Born in Baltimore, Maryland, he’s lived in Melbourne and Wollongong, Australia since 1975. Warren earned a BA at the State University of New York, Albany in 1971; an MA at the University of California, San Diego in 1975; and a PhD at the University of Wollongong in 2007. 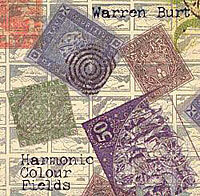 Influenced by early minimalism–including the music of La Monte Young, Charlemagne Palestine and Harold Budd, and color field paintings by the likes of Mark Rothko and Barnett Newman–Harmonic Color Fields is a “set of five computer pieces which explore static microtonal harmonic fields.” Basically, we’re talking about multiple layers of shrill, melancholy drones courtesy of such instruments as the Roland Sound Canvas synth, kinetic music machine, a PC286 Compatible computer and Russ Kozerski’s Drummer program. This album is perfect listening for any happy camper trapped inside on a rainy day. But, if you’re feeling despondent or suicidal, avoid it like the plague. This music is so gloomy, it may just push you over the edge. You are currently browsing the archives for the Warren Burt category.